Said to be an incarnation of Krishna’s brother Lord Balarama Himself, the Mridanga is a powerful instrument, which helps to carry devotees into blissful ecstasy while they chant the holy names of Krishna. 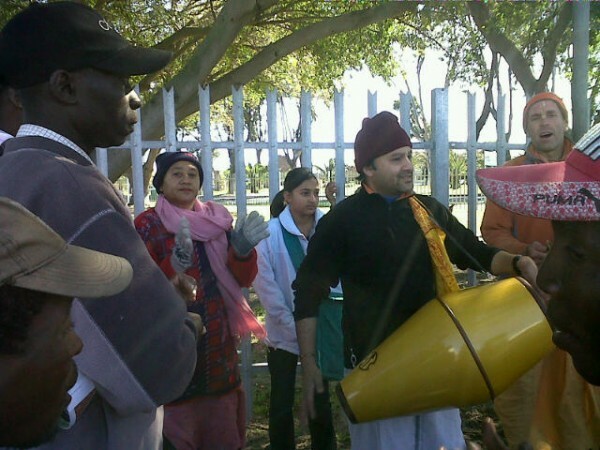 In Kirtan, with thousands of people or just one or two, the Mridanga raises the consciousness and allows one and all to focus more fully on Krishna. Tilak Mridangas are available in 2 sizes. This is the page for the normal/big size (25 inches long). Click here for the small size. The Small Tilak Mridanga's are great for children or for traveling! Nakula Prabhu plays the new Tilak Mrdanga. This is the new fiberglass mrdanga based on the design of the original ISKCON "Balaram Mridanga" but the Tilak Mrdanga is now a much improved and more reasonably priced mrdanga. Introducing the new Tilak Mridanga! The Mridanga is made from hard wearing fiberglass and is built to last. On the body of each is the famous "Tilak" symbol that distinguishes the Vaishnava. This will help you to remember the spiritual and service aspect of playing the Mridanga. After years of research and development the new fiberglass Tilak Mridanga has been produced to replace the now mostly unavavilable Balarama Mridangas. The Balarama Mridanga was first produced at New Dwarka (ISKCON Los Angeles) to solve a big problem with the clay Mridangas from India. The clay Mridangas are very fragile. A slight impact will cause them to break. To avoid this problem the fiberglass "Balarama Mridanga" was invented. It was a grand success and now the new and improved Tilak Mridanga is now available at almost half the price of where the Balarama Mridangas were priced. By improving the production methods and producing the drums in a large quantity we have been able to both improve the quality of the Mridangas significantly and dramatically reduce the price at the same time. 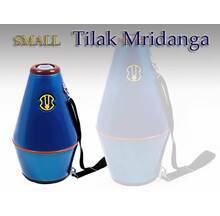 With a resonant bass head and a beautiful, crisp treble head, Tilak Mridangas have top-quality sound. 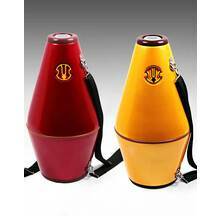 They are easy to tune, and with the included tuning key you can tune up on the fly. Have you ever been out on Harinam Sankirtan and had the weather suddenly change from a beautiful sunny day to what might be best described as a "beautiful" shower? Tilak Mridangas won’t fall apart in the rain! The drum holds true and stays in tune regardless of the season. 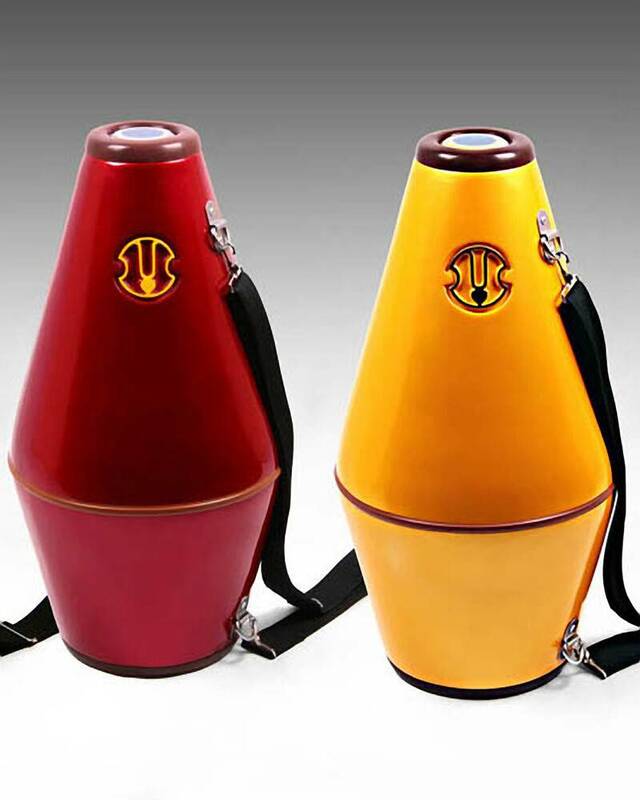 The vibrant, glossy finish adds beautiful color to your Harinam party. ** NOTE ** You can hear in the video how much more the Tilak mrdanga sounds like a clay drum than previous fibreglass mrdangas. You want an instrument that sounds great in any weather. You enjoy Harinam and refuse to let little things like weather get in your way. You want a rugged instrument that can stand up to the beating of a Ratha Yatra or big festival Kirtan. You want an indestructible instrument to give to a young child so he can channel his energy toward Krishna (get them a small sized Tilak Mridanga). Packed in the box: Weight: 5 kgs (11 lbs), Box Size: 13.5"x13.5"x26"